In case you missed the memo-- we did-- there was a black repaint of the aligator figure at C2E2 earlier this year. It's essentially the same figure with a different (likely repurposed) firearm rather than a melee weapon. Neat! Now who can help us get one? The fourth (New York Toy Fair, C2E2, and SDCC) release of this mold will actually be available to buy! 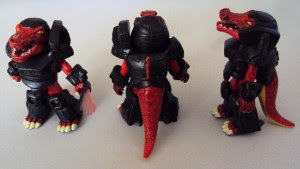 The first three Battle Beasts Aligator Minimates figures were exclusive to various shows, but this one according to the Art Asylum blog will see release through the upcoming Minimates carry case. Rejoice!